Russia has information about a planned US air strike on Damascus involving chemical weapons that would be blamed on Syria’s Bashar al-Assad in an attempt to frame him, Vladimir Putin has claimed. Without offering any proof to support the assertion *, the Russian President made reference to strikes on suburbs in the south of the Syrian capital which he suggested would be the target of the supposed US raids. * LD : “Without offering any proof to support the assertion...” Maybe Putin is taking a leaf out of America’s book. The US attacked Syria “without offering any proof to support the assertion” that Assad had used chemical weapons on his own people. The provocative comments* come as the Russian leader warned of the worst relations between Moscow and Washington since the end of the Cold War. * LD: It is apparently a “provocative comment” to state the truth: that the US had pulled a similar stunt in 2003 when it had breached international law by attacking Iraq on the basis of a lie: that Saddam Hussein had weapons of mass destruction with which he was threatening to attack the West. 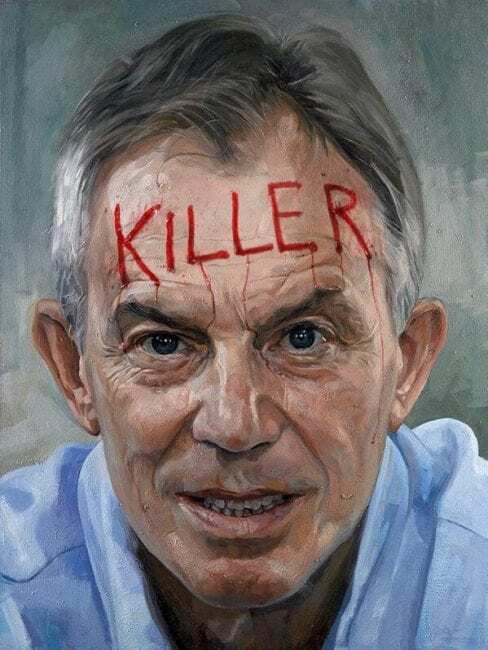 British Prime Minister Tony Blair, moreover, had lied to the Brits by stating that Saddam could send nuclear-armed missiles to London in 45 minutes, causing immense havoc and destruction. Nothing has been done to bring this egregious war criminal (pictured) to book. These are the sanctimonious hypocrites now assuming the moral high ground in regard to Assad’s alleged crimes in Syria involving the use of chemical weapons. Responding to questions about the escalating dispute with the US, Mr Putin said Moscow would tolerate criticism from the West of its alliance with Mr Assad, but that it remained hopeful that attitudes would eventually soften. Speaking to reporters on Tuesday — hours before US Secretary of State Rex Tillerson is due to arrive in Moscow — Mr Putin said he would appeal to the Organisation for the Prohibition of Chemical Weapons to investigate the recent alleged chemical attack in Syria. “We have information from different sources that these provocations — I cannot call them otherwise — are being prepared in other regions of Syria, including in the southern suburbs of Damascus where there are plans to throw some substance and accuse the official Syrian authorities,” Mr Putin said, after holding talks with his Italian counterpart Sergio Mattarella. He added that some countries had voiced their support for the US air strike on Syria in order to build closer relations with the new Trump administration. Russian Foreign Minister Sergey Lavrov is to meet Mr Tillerson on Wednesday. Earlier reports suggested Mr Putin would also meet the US diplomat, something Moscow has not commented on. Russia has been a long-time supporter of Mr Assad’s government, which was accused of launching a chemical weapons attack on Idlib province. That incident prompted Donald Trump to launch a cruise missile strike from two warships based in the Mediterranean targeted at an air base said to have been the base from which the original chemical attack was launched. Meanwhile, Russia’s General Staff has said the Syrian government is willing to let international experts examine its military base for signs of chemical weapons. LD : The latest news is that Assad’s alleged chemical weapons attack in Syria, which caused Ivanka to break down in tears, means that Papa Donald can no longer tolerate Evil Assad at the helm in Syria. Assad has to go, regime change now being essential if only to spare Ivanka’s tender feelings. Pleasing Jared is also, of course, a top priority. Families that stay together must slay together. “Last night Pen­tagon chief Jim Mat­tis said the strike by 59 Tom­a­hawk mis­siles de­stroyed a fifth of As­sad’s work­ing war­planes. In a sep­a­rate de­vel­op­ment, the White House de­fied threats from Rus­sia and Iran to say Mr Trump was pre­pared to ini­ti­ate fur­ther at­tacks on Syria. It ap­peared to widen Amer­ica’s terms of en­gage­ment by say­ing Mr Trump would con­sider a renewed re­newed at­tack if civil­ians were tar­geted by bar­rel bombs – a high explosive con­ven­tional weapon – as well as chem­i­cal weapons. LD: Evil Assad killing Syrian babies in an alleged chemical weapons attack is “unacceptable” to the noble American elite, but nice Israelis killing Palestinian babies in Gaza with white phosphorus is apparently totally acceptable to the same noble elite. Mr Spicer said de­feat­ing ISIS and get­ting As­sad out of power were twin US goals in Syria. While vis­it­ing Scot­land, Mr Trump’s sec­ond son Eric said his father would not be ‘pushed around’ by Mr Putin. The busi­ness­man, who runs the fam­ily prop­erty em­pire, said there would be ‘no one harder’ than his father if Rus­sia ‘cross us’, and talks of war did not scare the Pres­i­dent. He also told the Tele­graph his father’s de­ci­sion to bomb a Syr­ian air­base was in­flu­enced by the re­ac­tion of his sister Ivanka, who said she was ‘heart­bro­ken and out­raged’ by the atroc­ity. To summarize: Putin has issued us with advance warning to expect more false flag attacks in Syria carried out by the US and its allies in order to pin the blame on Assad for these forthcoming attacks. These attacks might even involve the deliberate destruction by the US and its allies of US planes and personnel, causing outrage in the West. This would then give the US a perfect pretext for carrying out a full-scale attack on Syria. It seems Trump and his Jewish handlers have no scruples about starting WW3.